A salesman wants to sell me an immediate fixed annuity which will start paying me $1,300 for the rest of my life. I’m turning 66 years old in April and that sounds nice, but I’ve always thought that annuities are not the best option. It will cost $260,000 and pay $15,600 each year. Is that a good deal? Isn’t that a 6% guaranteed return each year? If not, how should I think about it? What should I be worried about and what are the alternatives to an annuity? We don’t recommend annuities as part of your financial plan. An immediate fixed annuity is not an investment. It is an insurance product. It is purchasing up-front the right to collect a fixed amount of income from the insurance company (in this case $1,300 per month) for the rest of your life. The two things to note are that you purchase instead of invest and the amount is fixed, meaning it will never change. Isn’t that a 6% guaranteed return each year? An immediate annuity is not an investment. Any salesman who represents an annuity as an investment or pretends that the payment is a return on your investment is being fraudulent. In order for the $15,600 to be a return on your investment, you would have to still own the $260,000 of principal. In fact, you would not. When thinking about annuities, most people fail to take into account the immediate loss of 100% of your principal. Buying an annuity is like purchasing any other insurance policy – there is no new item you own, just a contract. The $260,000 you pay is no longer yours. The insurance company now owns it. For the next 16 years and 8 months the insurance company is simply handing you back your own money, so the “return” on your investment for that time is negative. 16 years and 8 months later, you only have what you paid them in the first place, gaining nothing. The internal rate of return (IRR) for these cash flows is easily calculated using either a financial calculator or the spreadsheet function IRR by putting in -260,000 for the first year and then 15,600 for each subsequent year. You can compute the IRR for however long you expect to live. By age 83, 17 years after you bought this immediate fixed annuity, you will finally be paid back and start to receive money which was not yours in the first place. At age 66 your average life expectancy is 19.4 years – age 85. 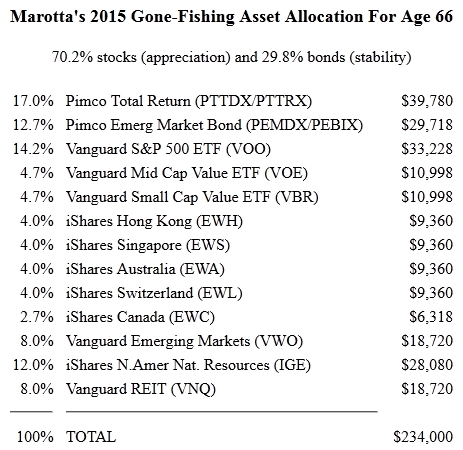 At age 85 your IRR will be 1.35%. Even if you live to be 100 years old, your IRR will only have risen to 4.77%. Inflation averages about 4.5% a year, meaning that even if you live to be 100 years old you will barely have earned more than inflation. And even if you live to 150 years old, your IRR will never reach 6.00%. Never. If it is not a 6% return on investment, then how should I think about it? You lose ownership of 100% of your assets and any proceeds you could have gotten from those assets the moment you sign the annuity contract. Historically, the stock market appreciates about 6.5% over inflation, making the nominal return of the stock market about 10-12%. Historically, the bond market appreciates about 3% over inflation for a nominal return of 7-8% (although the Federal Reserve has been keeping interest rates artificially low). Normally, if your investments are earning 10% annually they should double about every 7 years. And if they are earning 7% annually they should double about every 10 years. Remember that for the first 16 years the insurance company is just handing you back your own money. But over this time period, earning 10% a year, your investments should have quadrupled. Meanwhile, you will have reached your life expectancy and the insurance company is left with the remainder of your assets. This is usually extremely lucrative for the insurance company. Every step of the process is laden with fees and expenses that pay people and processes that don’t bring you value. It all starts with a large commission to the salesman who sells you the annuity in the first place. Your payments begin at $1,300 per month or $15,600 per year but their purchasing power diminishes by inflation each year. Assuming 4.5% inflation, by the time you have been paid back at age 83 your purchasing power has diminished to less than half it’s original value: $615 per month or $7,382 per year. And by the time you are 100 years old, what started at $1,300 per month has been reduced such that your monthly purchasing power is only $291 a month. Insurance salesmen will be quick to tell you that you can purchase an immediate annuity which is not fixed but will rise each year to compensate for inflation. There are two versions: one rises by 3% each year and the other rises with the CPI index. Neither really helps. In the first case, inflation averages more than 3% so while it takes the sting off of your loss in purchasing power, it still robs you of value. And in the second case, the CPI index no longer measures the full effects of inflation. Furthermore, annuities which have some inflation adjustment are much more expensive. That same $1,300 monthly stream will cost much more up front. We received the following quotes for a $1,300 per month annuity rising by 3% inflation: $323,542, $339,759, and $347,499. For the policy rising by CPI Index inflation we received these quotes: $318,556 and $349,635. So the best quote we received for a fixed $1,300 per month policy was $234,000. For that same amount of money we could purchase an inflation-adjusted annuity of $940 per month rising 3% each year or $954 rising by the CPI index each year. Neither of these would actually keep up with inflation, but at least they would do better than the immediate fixed annuity. Is this annuity a good deal? What is a good alternative to an annuity? A properly invested portfolio with withdrawals based on the age-appropriate safe withdrawal rates. Our maximum safe withdrawal rate for age 66 is 4.43%. This means that you could withdraw 4.43% of your properly invested portfolio, increase that number by real inflation each year, and have a better than 80% chance of being able to keep that up for the rest of your life. Therefore, with a portfolio of $234,000 at age 66, you should be able to withdraw $10,366 (4.43%) a year or $864 per month. You should be able to increase this by inflation each year and you should be able to do this, on average, until you turn 101. This safe withdrawal rate comes from running thousands of random iterations of what might happen in a method called “Monte Carlo” simulations. This includes all historical returns and estimated probabilities of what might happen. In the financial planning world, having an 80% chance or reaching your life expectancy without having to reduce your purchasing power at all is considered success. We plan our safe withdrawal rates to keep purchasing power constant, on average, until age 100, which should give you a greater than 80% chance of maintaining purchasing power for the rest of your life. Just to be clear, there are no guarantees. Even an annuity company’s payments are dependent on the solvency of the insurance company. The company with the lowest price for each of the annuity quotes we are using was AIG, hardly a company with a stellar solvency history. The company with the best financial stability would have paid either $875 rising 3% each year or $870 rising by the CPI index each year. What is the advantage of handling my own finances as opposed to buying an inflation-adjusted annuity? If the markets do better than 3% over inflation (and on average they should), you will have control of the extra money and your lifestyle can be proportionally increased. If you need more money one year, you will still have control of your portfolio and draw from that. If you die before age 100, you will leave your heirs (or your favorite charity) the remainder of your investments. Since we are conservative in calculating safe withdrawal rates and longevity, this could be a significant amount of money, and the choice of where that goes is in your control. If inflation is above 3% or the CPI underestimates the increase in the cost of your lifestyle, you will still be able to increase your spending rate, which you could not with an annuity. You will have control of your rate of spending and not be subject to an automatic reduction in your purchasing power. What are the possible downsides to handling my own finances? Risk: First, nothing is guaranteed. Investing in the markets is inherently volatile in the short run, no matter how inherently profitable they are in the long run. When the markets bounce around you may want to adjust your withdrawal rate in response to market movements. Even $100 a month makes a large difference in long-term financial projections. And recomputing your safe spending rate each year is an important discipline. Emotion: When the markets bounce around we are all wired to do the wrong thing: sell what has gone down and buy what has gone up. The best response whenever you are worried about the markets is to rebalance your portfolio. Knowledge: A little knowledge is necessary to handle your own finances. Thankfully, there are many ways to get it. Reading MarottaOnMoney is certainly one of them. We do not recommend buying an immediate annuity, fixed or inflation-adjusted. We would recommend either handling your own finances or finding a fee-only fiduciary who is also a member of NAPFA in your area. If you want to keep it simple, then we would recommend following our safe withdrawal rates by age and 2015 gone-fishing portfolio. If you rebalance once a year, do it in April. If you want to rebalance a second time during the year, do it in October. Rebalance any time you get nervous about the markets. Our safe withdrawal rates by age would recommend starting at age 66 with a withdrawal rate of 4.43% per year. For a portfolio of $234,000, that would be a yearly withdrawal of $10,366 or a monthly withdrawal of $864. Photo by StockMonkeys used here under Flickr Creative Commons.